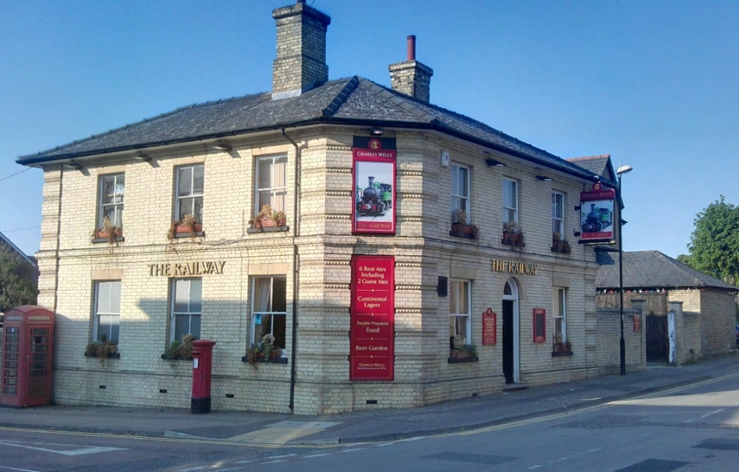 Further to Charles Wells’ withdrawal of their planning application for the Railway Arms I can now report that pre-application discussions concerning a revised scheme are expected to commence shortly. In advance of last week’s Town Meeting, and a request for an update on their thinking, we had a call from the company to say that an architect had been briefed and that a document would be submitted to UDC planners by the end of the week. Clearly we’ll all be interested to see where this may lead but, at the moment, all we have is that the company were considering developing within the footprint of the current building, moving the toilets upstairs and reducing the size of the staff flat. We’ll be keeping a close eye on the UDC website and we’d hope that any proposals arising from discussions will be made public at the earliest opportunity. They would surely need to address the concerns raised in opposition to the previous scheme which centred on the partial focus of the application and it’s silence in respect of the local heritage listed outbuildings and the ACV listed, green open space, gardens. Protection of the historic fabric of the building/s, parking arrangements, DDA compliance, health and safety and the requirement to create a viable business will again be key to a solution. The news lays to rest any fading hopes of a last minute draw down of funds from the More Than A Pub programme. The end of March will see the programme draw to a close and we should all congratulate its constituent bodies on their support and funding for 38 community owned pubs across the country. Many more groups, ourselves included, remain in the pipeline and the news that further funding via a second More Than A Pub programme will be available from June is very welcome indeed. We remain confident that, if by chance, the current discussions fail to identify a solution that the owners and a tenant can make work, MTAP2, the share capital that remains in SWCP Ltd and the emergence of alternative funding streams, will ensure that our offer remains on the table. All parties are aware that we believe that the Railway, as it stands now, meets all the planning requirements outlined above and that, in community ownership – relieved of the requirement to turn a hefty profit, it can be a viable and important part of the life of this town for many years to come. We are fortunate that this renewed focus on the future of the Railway Arms comes just as we begin the build up to our next Pop up Pub event at Fairycroft House. We’ll have plenty to talk about over the coming weekend (22-24 March) and plenty in terms of community benefit to enjoy. There will be home-made and locally sourced food on Friday and Saturday. Beers from the Toppesfield Green Man and Wylde Sky breweries, along with our community produced cider and wines from Joseph Barnes, make up our locally produced and sourced bar offering. Friday night is ‘Race Night’ with ‘Honest’ Tim Walker taking your punt on all the runners in our televisual race meeting. We’ll be raising money for The Greyhound Trust so come along to enjoy the fun and support a good cause. Saturday aftenoon will see games in the main hall (details to follow) and the evening will offer open stage performances from around 7pm supporting a quality bill culminating in Sharp Set, the famed spin-off from the Walden Buskers. Peter and Dom promise a bluesy, old timey, English/American/Irish folk session to complement last weekend’s St Patricks Day celebrations. Sunday offers a quiet lunchtime session (12-4pm). We’re looking forward to seeing you all over the weekend and would only ask that you come and enjoy yourselves, bring friends and family and make it another special community Pop up Pub. That said, should you wish to get involved helping behind the bar or with preparations, cooking and serving food, decorating Fairycroft House, organising games, setting up the stage or in any other way please, please do get in touch. Opportunities for volunteering abound.